Clients will get a scripting error in IE, prompting them to stop the scripts or continue running them. 2016 theme bases off newer jqueries and JS files, in which are provided by IE10-11 for more DLLs and such added for scriptures. Anything IE9 and below do not contain the proper jqueries and DLLs to operate correctly. Either upgrade IE or use a different version of the theme, anything pre-2016 works fine. This is the scripting error you might see. 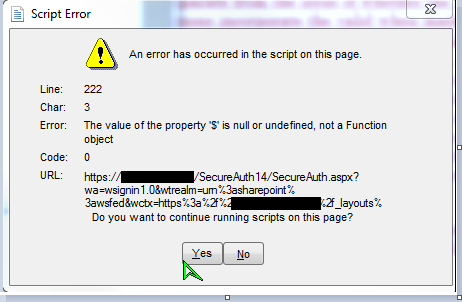 Since the SecureAuth page is returning the error with a layout problem, it's more than likely an outdated version of scripting. To combatant this, we can downgrade their theme from 2016 Light to anything else, such as: 2012, 2013, or even Legacy.